Since healthy eating habits are solidified by adolescence (and maybe since preschoolers are naturally selective eaters), many preschool teachers like to include a Food and Nutrition Theme in their preschool curriculum. Especially during November when our homes are suddenly infiltrated by high carbs and sweet treats. 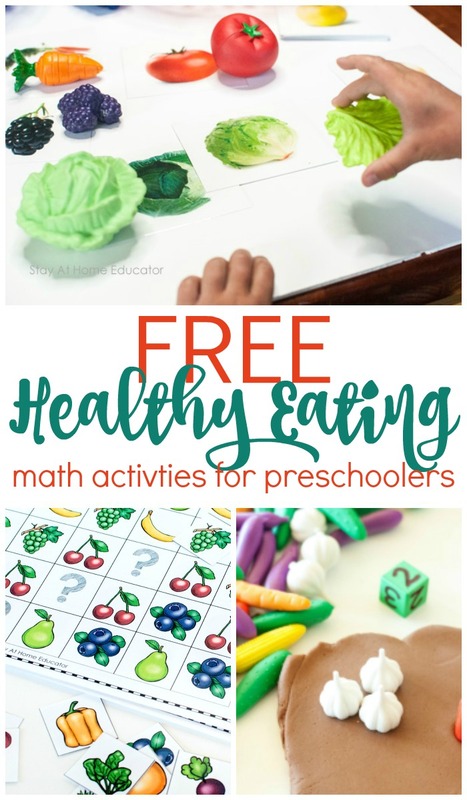 So this year during your Food and Nutrition Theme, you’ll want to include these six preschool math activities. 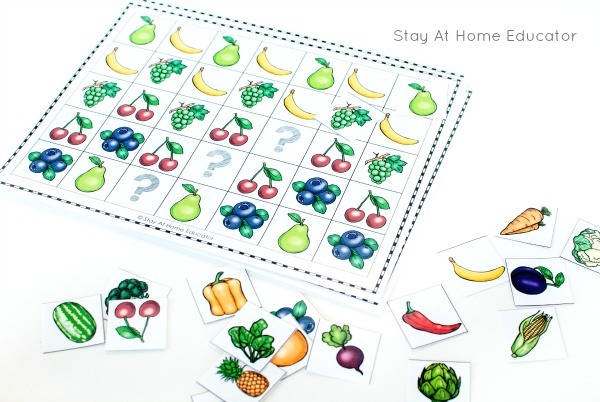 I’m focusing on a fruit and veggie patterning activity, but read to the end of the post to get five additional food and nutrition themed math activities. 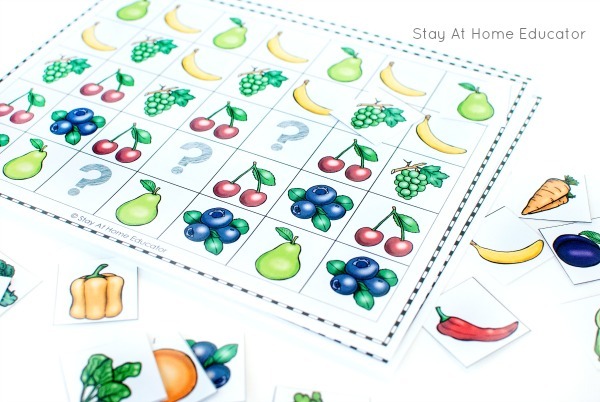 Oh, and grab your free printable fruit and veggie patterning cards, too! It’s at the end of this post. During one of my first years teaching preschool, I had offered some fresh sliced peaches and bananas to my small class of eight students for their mid-morning snack. Now, I always feel like serving fresh fruit or vegetables is a really big deal in preschool, especially when I am either fronting the money for them myself or asking parents to put up their own money to feed our class snacks. (I have opted not to be a part of the national food program for in-home preschools). Fresh fruits and vegetables can be expensive. Especially peaches. Well, that morning, I invited our special helper for the day to pass out the plates of fresh peaches and bananas, and he carefully helped pass out cups of water to each student. Boy, did that get under my skin. I always encourage my preschoolers to try disliked food anyway, because “one day you might like it.” And often I can convince them to take a few bites anyway. But not this day…and that got under my skin even more. Now, I’m not going to disclose how I handled the situation, but I will tell you it was not my finest moment in teaching. And, wow! Have I learned a lot since then! It turned out that my “picky” student had an aversion to certain textures, specifically those that are kinda’ wet and slimy. That’s not uncommon for children in the preschool years. And do you know what?! That’s right! It is totally and completely okay for a child to be selective in what they eat. But here’s what you, the parent or preschool teacher, can do to help broaden a child’s perspective on food. Expose them to more of it. And do it frequently. Which is just one of many reasons why we teach a Food and Nutrition Theme in preschool. Even a free fruit and veggie printable can make a difference. There’s nothing better than activities that can meet multiple learning disciplines as well as multiple skill levels. This fruit and veggie math activity does just that. 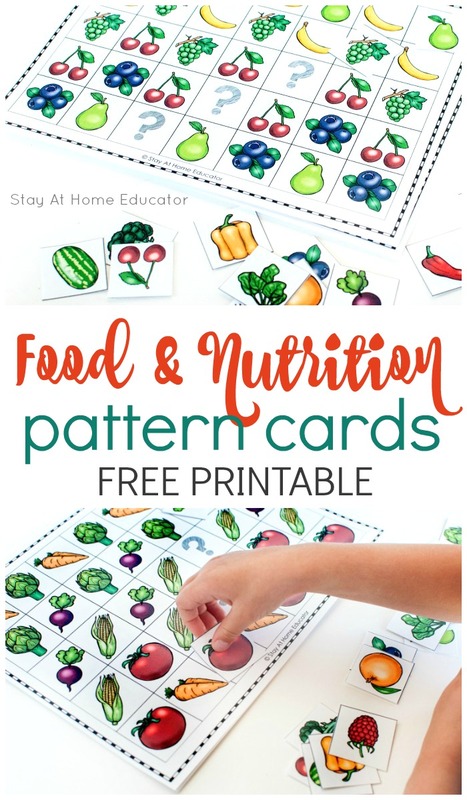 Be sure to read to the end of this post for more food and nutrition theme math activities and some free printables, too! Print in color on heavy cardstock and laminate for added durability. 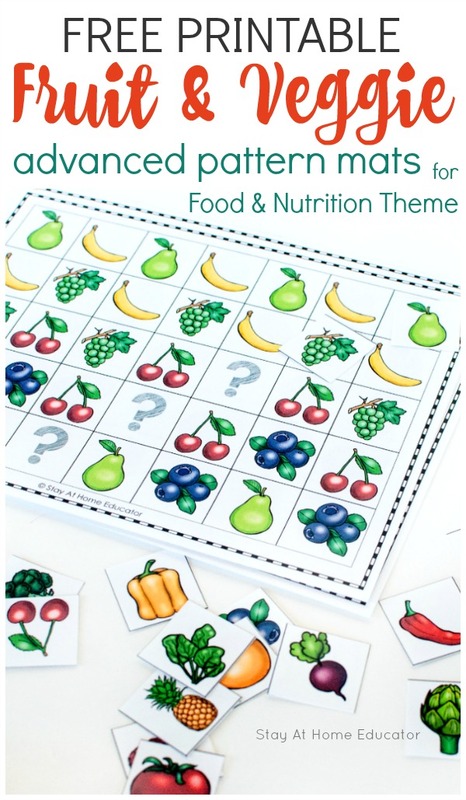 Set the patterning mats on a tray with the food cards near and invite your preschooler to join you in this food and nutrition theme math activity. No, what makes this math printable unique is that these are not traditional patterning cards where the task is to fill in the last space after reading the pattern. This is a patterning mat, and preschoolers are tasked to fill in the middle pieces of the patterns. Now, that is a lot more challenging! See how the question marks fall in different places in the patterning mat? In the first row, the missing pattern piece is at the end of the row. In the second row, the missing pattern piece falls second to the last. The question mark, or missing pattern piece, moves forward in each row. This makes it substantially more challenging for preschoolers, especially for those preschoolers who are already quite good at continuing and completing patterns. This approach to filling in patterns is good for preschoolers in that is requires them to really think critically about what they are seeing and the rhythm of the pattern. Think your preschooler will enjoy this patterning activity? Go ahead and download it by clicking the image below! Then keep reading for even more healthy eating activities! Looking for more food and nutrition theme math activities for preschoolers? You can try some of these ideas. Use the free printable below to do the above pattern activity. Invite your preschooler to use play food to match to the pattern pieces. Invite your preschooler to use the pattern cards in a graphing activity or to make up their own patterns. Invite your preschooler to build a vegetable garden like this one! 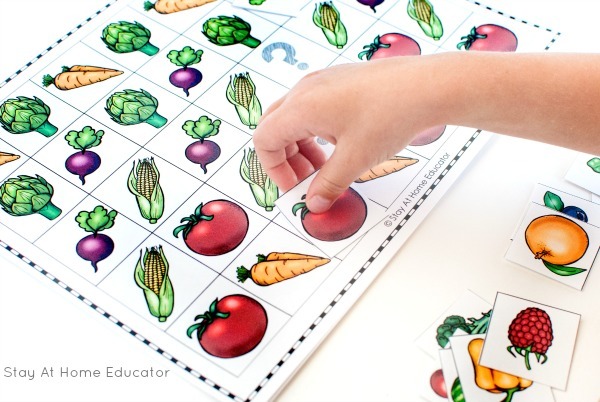 Try any one of these food and nutrition math activities for preschoolers! Hi Ruth! The download should have arrived in your email. Sometimes it can tae up to 24 hours, but it could have also landed in your spam folder.